Grand Seiko Historical Collection 62GS, the SBGR095 recreates the original 62GS from 1967; one of the most accurate mechanical self-winding watches at that time. This is no.377 of limited 600 pieces worldwide. Introduced in 1964, the Grand Seiko 57GS, nicknamed "Self-Dater", was the first Grand Seiko with a date function. This SBGV011 pays homage to the "Self-Dater", with great deal of the original classic styling being preserved, such as the basic dimensions, the ultra-Spartan dial, and most importantly, that very distinctive case. The dial features the gorgeous sunburst finish that is so closely associated with Grand Seiko. Interestingly enough, the 1964 Self-Dater was actually the first Seiko to debut the famous dial work that one now finds synonymous with the brand. Although it's hard to believe, there was a time when one couldn't buy a Seiko with a sunburst finish, but 1964 changed all that. Moreover, the 1964's crown is used on the SBGV011 to pay a sincere homage to the original, something Seiko or Grand Seiko haven't utilized in decades for any other models. The heart of this watch is the Grand Seiko 9F movement, which is arguably the most advanced quartz movement ever made and easily the top three in the quartz world. It has a whole host of high-end features that have never been replicated by any other company or even on any other Seiko; and the most standout feature is its 10 seconds per year accuracy, thanks to thermo-compensation. That accuracy is further enhanced by a very easy to use fine adjustment screw, which allows a watchmaker to simply turn a screw to make the watch runs faster or slower, compensating for quartz drift decades later. Speaking of watchmakers, when one replaces the battery in the 9F quartz, there's no chance of contaminating the crucial lubricant inside the watch with dust from outside. The cabin of the movement is sealed even during a battery change, which gives the lubricant inside an extraordinarily long life. This is no.12 of a limited production run of 900 pieces worldwide. The 44GS is a limited edition tribute to one of Grand Seiko's most historical references, the 1967 44GS. The 44GS was conceived by a young university student who believed that luxury watchmaking was more than simply producing a fine movement, which Seiko was already doing; but also about creating a beautiful and interesting case. Thus, the 44GS was producing with multiple polished angles and a case shape totally unique to Grand Seiko. 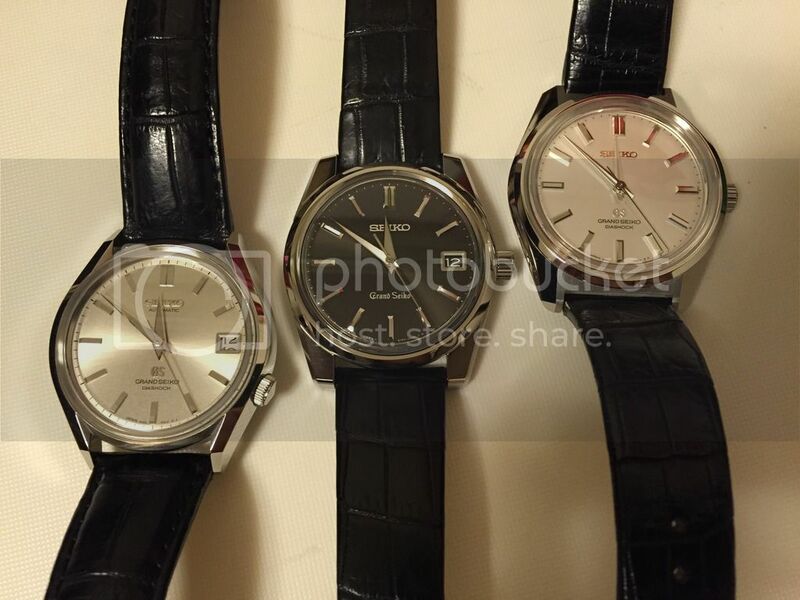 It is this case that has come to define Grand Seiko to this day. This is no.576 of a limited production run of 700 pieces worldwide.